This species is the only Psittacara conure with a blue forehead and crown. P.a. acuticaudatus: Both adults forecrown to lores, cheeks, and ear coverts dull blue; breast on some birds washed blue; tail green on upperside and brown/red on underside tipped with yellow/olive; upper mandible horn in colour tipped with grey, lower mandible grey/brown. Eye ring bare and creamy white. Eye orange. P.a. neumanni: Both adults forehead to nape blue; underparts suffused dull blue. P.a. haemorrhous: Both adults as in neumanni, but paler blue confined to forehead and forecrown; blue suffusion absent on underparts; both mandibles horn in colour. P.a. koenigi: As in neumanni but undertail less brown/red; smaller in size. P.a. neoxena: As in haemorrhous, but underparts washed with blue; smaller in size. P.a. acuticaudatus: As in adults but blue confined to forecrown; no blue wash on breast; tail shorter. Eye brown. P.a. neumanni: As in adults but tail shorter and eye brown. P.a. haemorrhous: Blue found on forehead only, or instead a red/brown tinge; tail shorter. Eye brown. Calls made in flight loud and repetitious. Also babbling and musical notes. UNEP-WCMC CITES Trade Database, January 2005. Common in US, less so elsewhere. Aviary or suspended enclosure, minimum length 3m (9.8 ft). Cooked beans and pulses, boiled maize or corn; sunflower seed, dry, soaked or sprouted; fruit such as: apple, orange, bananas, cactus fruits; rearing food made with hard-boiled egg, wholegrain bread and carrot, all ground to crumbly consistency; vegetables such as: carrot, celery, green beans and peas in the pod; spray millet; complete pellet. Socialization, bathing, toys such as ladders, swings, puzzle toys, foraging toys, bird-safe chew toys. 12" x 12" x 18" (30.5cm x 30.5cm x 46cm) vertical box or 10" x 16" x 12" (25.4cm x 40.6cm x 30.5cm) diagonal box. Trade has been heavy: 193,299 wild-caught birds were traded on international market from 1981. A.a. neoxena at risk from tourism, the wild bird trade and predation by rats. P.a. acuticaudatus: E Bolivia and SW Mato Grosso, Brazil, to Paraguay, W Uruguay and N Argentina, south to La Pampa and SW Buenos Aires. Introduced to Florida and S California, US. P.a. neumanni: highlands on E slopes of Andes in Cochabamba, Santa Cruz, Chuquisaca, and possibly Tarija, S Bolivia. P.a. haemorrhous: NE Brazil in Piaui and N Bahia. P.a. koenigi: NE Colombia, from Guajira Peninsula and Santa Marta Mountains south to W Meta, and N Venezuela, from NW Zulia to Falcon and N Lara, and Aragua east to N Monagas and south to N Bolivar and southern Apure. P.a. neoxena: Margarita Island, N Venezuela. Found in dry deciduous forest and other open habitats including semi-desert. Seen in caatinga and cerrado with stands of Mauritia and Buriti palms in NE Brazil, from gallery forest in Venezuela and Colombia, almost desert in Bolivia and pampas in Argentina. Up to 2600m (8528 ft). Food items include Sorghum and Bambusa seeds, berries of Condalia lineata and fruit of cacti and crops such as mango; also insects. Feeds in trees and on the ground, in pairs, or small flocks; congregations larger when food abundant. In some areas birds roost in crevices on cliffs. 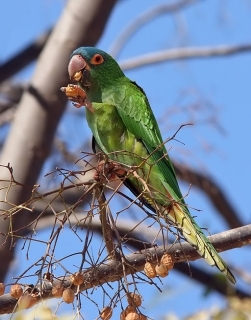 May be seen with Mitred Conures (Aratinga mitrata) and White-eyed Conures (Aratinga leucophthalma). December, Paraguay and Argentina; March-July Venezuela.